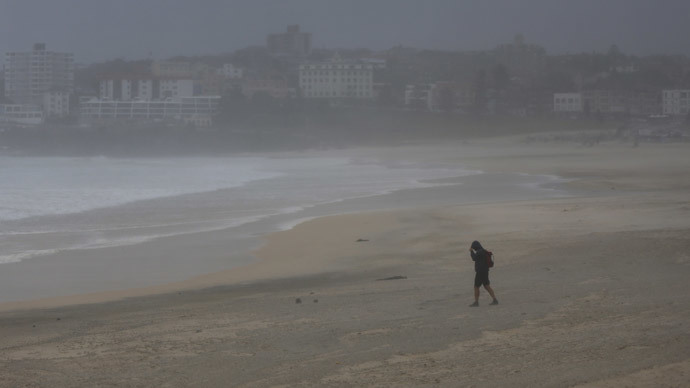 A powerful storm hitting Australia’s New South Wales (NSW) coast has killed at least three people so far and left thousands without power. The gusts of wind averaged 100km/h and some 30cm of rain fell in some areas, many times more than usual. The average yearly amount of precipitation in the region is 5.5cm. People on the ground have taken to social media to post some of the damage from the storms, including sunken boats, floating houses and fallen trees. "It looks very much like we have lost three residents," NSW Premier Mike Baird said. "They were elderly residents. At the moment, the circumstances are being worked through, but we do want their families to know our thoughts and prayers are with them," he added. Two other individuals remain missing in the town of Dungog, north of Newcastle, where four houses were floating down the street. Evacuation procedures have been organized for the town. Baird also said that 200,000 homes remain without power as of Tuesday, adding that the storm could get worse in the Hunter and Central Coast regions. The minister for police and emergency services David Elliott described the disaster as “once in a decade storm, the likes of which we haven’t seen since 2007. “Today’s events are going to test our emergency services but they are there to be tested. We have seen, as the Premier said, 4,500 responses thus far,” he added. Fifty people were rescued, Elliott confirmed.